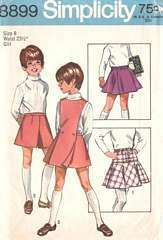 Vintage Simplicity sewing pattern 8899. Flared gored skirt and flared skirt have elastic waist. Pant-skirt with side zipper has waistband with back elastic and lined detachable bib. Girls Size 8; Waist 23.5; Hip 28.